There may well be no better dude on TV than Parks & Recreation's Ron Swanson. The man simply knows what time it is—he understands the value of a glass of scotch and a steak, he's got a thriving career as a smooth-jazz saxophonist, and he's a master woodworker. He might not be the kind of guy to play video games, but that doesn't mean he doesn't deserve his own video game tribute. Thankfully, Justin Russo made this amazing label for a classic NES cartridge. Swanson: All The Bacon. Just look at it. JUST LOOK AT IT. Would you play this game? I would play this game. It works with the NES zapper! God, I would would so play this game. 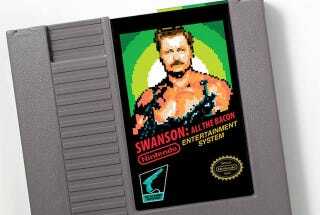 I bet that Ron eats bacon to regain health, and every level's boss is named Tammy. The piece is part of the 72 Pins collection which was just exhibited at YeTee Gallery, where some are available for purchase. The stuff at 72 Pins is so full of amazingness that you really should just go check it all out. Some of them have been around a while (and doubtless have been posted here before), though it seemed worth including some of my favorites.